Went out early around 4.30 tonight. Worked the point with no action so I moved down to Al's spot. Tide was coming in so I drifted downriver working some new spots. 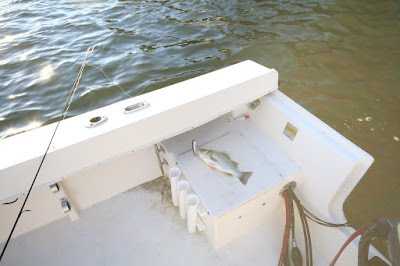 A little after 5 I picked up a very nice White Perch on my stillwater. This is was a rarity in itself, but the next cast was even more rare. 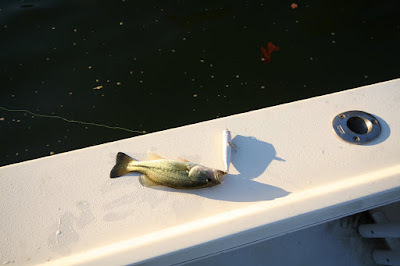 I have always believed that Largemouth Bass can be found in the South River, but had never caught one. Well that changed tonight. Small, but a LM non the less. On my next cast I had a huge Striper on, but lost it at the boat. Nearly had a SR Slam. Just found this blog via Tidal Fish and read every post...Great stuff - I love it! I live of off Glebe Bay, so I am especially happy to read about your adventures on the South.